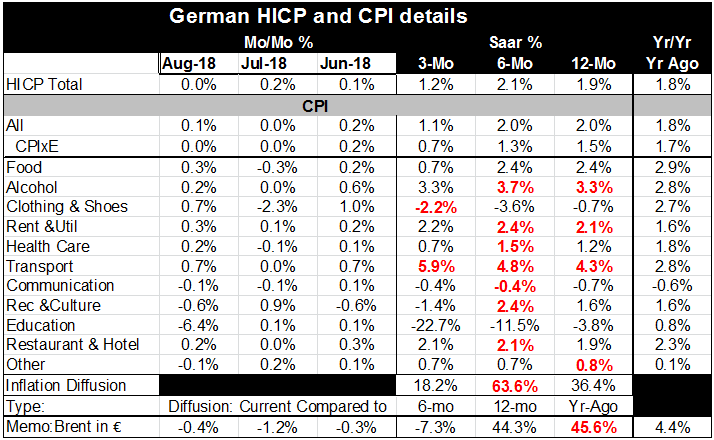 The German HICP is flat in August; its domestic CPI is up by 0.1% and the CPI excluding energy is flat. German inflation measured from 12-months to 6-months to 3-months shows a loss of momentum with year over year inflation at 1.9% to 2% depending on the gauge and with 3-month inflation at a pace of 1.2% or 1.1% depending on the gauge. Domestic ex-energy CPI inflation is also moving lower dropping from a 1.5% rise over 12-months to show a pace of 0.7%, well-under 1% over the last three months. Of course, the ECB targets inflation of a little less than 2% but only targets inflation for the EMU Area as a whole. Still there is not much in these German figures this month for the ECB not to like. Most importantly Inflation while near the ECB’s borderline pace for all of EMU is nonetheless on a declining path. Both the HICP and the CPI headlines as well as the CPI excluding energy show decelerating inflation. More broadly inflation only accelerates in two of eleven components over 3-months. Inflation accelerates in 63 pert of the components over six-months but only in 18% of them over 3-months. Over 12-months inflation accelerates compared to its pace of one year ago in only 36% of the categories. After a bit of a pick up over six months German prices have settled back down. Expressed in euro terms oil prices have fallen in each of the last three months. Germany’s experience is somewhat comparable to the other large EMU economies. France, Italy and Spain all have headline 3-month inflation slightly below 12-month inflation although in all-three countries inflation is above the 2% mark over 12-months. But France Spain and Italy all report much lower rates of inflation for core or ex-energy inflation. For France the pace over 12-months is 1.4% for Italy it is 0.9% and for Spain it is 0.8%. Both France and Spain also show their rates (ex-energy for France and Core for Spain) lower over 3-months than for 12-months. Italy shows its core rate higher over 3-months than over 12-months but its annualized pace over 3-months still is only at a rate of 1.2%. For all of EMU inflation is at a 2% pace and edges up to a 2.3% annualized rate over three-months. But EMU core inflation runs at 1.1% over 12-months and sinks to 0.7% over 3-months. On balance inflation in Germany, in the large EMU countries and for the Euro Zone as whole is quite well behaved even admitting that there is a flaw here and there. German inflation shows solid behavior as the breadth of inflation across categories is reinforcing the trend of mild inflation and of a slowing. The ECB recently has been taking its queue from the weaker core inflation rate. This month once again the ECB has opted to keep its policies on hold. That decision was taken just today at a regular ECB policy meeting. Inflation is not a problem and yet concerns about growth and the impact of the ongoing trade wars continues to play a role in putting central bankers back on their heels.